After Darshan Aarti, the devotees assemble for glorifying the cherishing memories of HG Aindra Prabhu at 8.00 AM and continue up to 12.00 noon on 19th July 2010. Prabhupad’s disciples and senior devotees narrate the wonderful activities of HG Aindra Prabhu and his contribution to the enlightening sankirtanas. A grand feast will be held at 1.30 pm and all are welcome for the feast organised on the memory of H. H. Aindra Prabhu. It was the desire of Aindra Prabhu to have his samadhi in his room and a pujari will be deputed to offer services to Gaura Nitai and the hundreds of Salagrams Aindra Prabhu worshipped. The room will be kept as a museum in memory of Aindra Prabhu, who departed us to Goloka Vrindavana to take part in the nitya-lilas of Rahda-Krishna and Gaura-Nitai. At 4.00 PM, the body of HG Aindra Prabhu was brought to the Krishna-Balaram Temple from Mathura Hospital. The body was bathed, dressed up and garlanded at 5.00 PM. With the accompaniment of the devotees of Vrindavan the body was taken on procession and made three parikramas to the temple. The body was then taken to the Samadhi of Srila Prabhupada for darshan. About a thousand bhaktas of Vrindavan took a procession and carried the holy body from the Vrindavan Mandir through the Vrindavan Seven Gosvami Temple Road chanting kirtan and reached Keshi Ghat on the bank of Yamuna. After bathing at Yamuna, the holy body was placed on a pile of wood for cremation and the flame was ignited at 6.38 PM by H. H. Mahanidhi Swami in the presence of .H. H. Radha Raman Swami, the Temple President Pancagauda Prabhu and Bhubanesvar Prabhu and other devotees of the temple. All through, the accompanied devotees enthusiastically chanted kirtan and danced around the holy flames of cremation as they did while H. G Aindra Prabhu chanted the Hare Krishna Mahamantra in the Krishna-Balaram Temple. He reasons ill who says that Vaisnavas die, When thou art living still in sound! The Vaisnavas die to live, and living try To spread the holy name around. His Grace Aindra Prabhu Attains the Spiritual Realm With extreme anguish we inform the devotees of the disappearance of His Grace Aindra Prabhu on the night of July 16, 2010. He was alone in his room worshiping His beloved Deities when apparently there was a gas leak from his cylinder. Some devotees heard a sound and there was some smell, but no one knew from where it came. Devotees knocked on Aindra’s door, but there was no response all night. His door is very thick, and there is one trap door in it. In the morning when Aindra prabhu didn’t come to the temple to dress Sri Sri Radha Shyamasundara, the devotees then could understand that something serious had happened. With difficulty they broke open the trap door, and only one devotee, Adi Kesava Das, was small enough to enter the room. When he entered he saw that the entire room was black and there was disturbance everywhere. It appeared that Aindra might have lit a match in the room and that caused the gas in the air to ignite and burn the room. Aindra was behind the altar. It looked as if he had tried to open the window, but was unsuccessful, so he offered his obeisances behind Sri Sri Gaura Nitai, and left his body in that position. When Adi Kesava found him, Aindra was already long gone, and his body was still offering obeisances. Krsna-Balaram Mandir 24 Hour Kirtan Mandal was inaugurated and is sustained by the express will of ISKCON’s founder-acarya, His Divine Grace A. C. Bhaktivedanta Swami Prabhupada. It functions to help generate a pure, spiritually surcharged atmosphere conducive to the advancement of pure devotional life. After the inception of 24 hour kirtana in 1975, the kirtana-yajna continued in a somewhat disorganized way for some diminutive period. In 1978, however, less than a year after the disappearance of His Divine Grace Srila Prabhupada, 24 hour kirtana at the Krsna-Balaram Mandir was unfortunately ground to a halt. Reinaguration commenced eight years later, during Kartika’s eve on Vijaya Dasami 1986, by the determined efforts of His Grace Sriman Aindra prabhu, a disciple of Srila Prabhupada, with the assistance and support of a few other soft-hearted devotees. 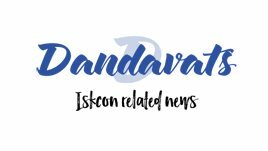 Aindra prabhu, recognizing the common sense in organizing a core group of kirtana enthusiast to ensure its continuance, reconstituted ISKCON Vrndavana’s 24 hour kirtana as a distinguished department of service. In the beginning, upon suggestion and sponsorship, hired singers and musicians formed part of the kirtana group. Within the first 6 months, however, Aindra prabhu, disgusted with the obvious escalation of material motivation amongst the kirtana party members, politely dismissed all the hired kirtaniyas, and since then till today, members of the Krsna-Balaram Mandir 24 Hour Kirtan Mandali receive no monetary remuneration. Pure sacrificial engagement intended to propagate a mood of cent percent selfless devotion to Krsna, that is the 24 hour kirtana ethic. Golokera prema-dhana, hari-nama-sankirtana. Our only real goal is vraja-krsna-prema. We keep body and soul together simply to facilitate this aim. Anyone wishing to advantage kali-yuga-dharma hari-nama-sankirtana at Sri Vrndavana Dhama, is cordially invited to cooperate with us and assist in this effort to please His Divine Grace Srila Prabhupada and all the acaryas in disciplic succession from Lord Gauranga. Your association would be appreciated in terms of the mutual spiritual benefit. Hare Krsna! 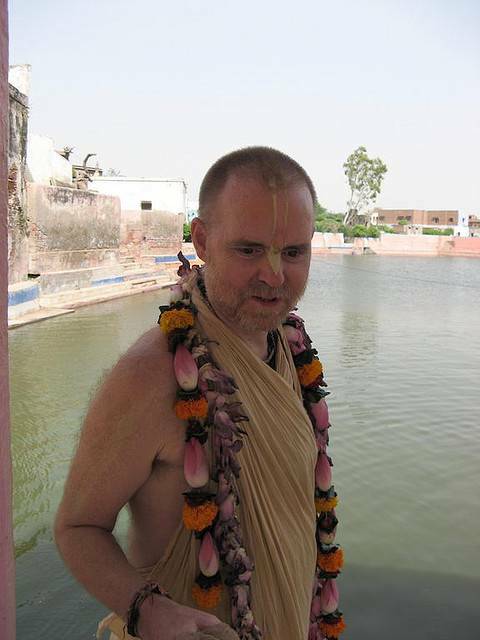 H. G. Aindra Prabhu has returned to Godhead today morning at 7.15 AM. He was found doing dandavat in front Goura-Nitai, his personal Deity, whom he worshipped. A devotee, who always helped him to serve his Deity, tried to open the door today morning, but Aindra Prabhu never turned up. The door was broke opened by the devotees and found Aindra Prabhu left this world forever to Goloka Vrindavana doing dandavat before the Supreme Lord. May he ever dwell at peace in Goloka and sing the glories of Radha-Krishna and enjoy His wonderful pastimes. 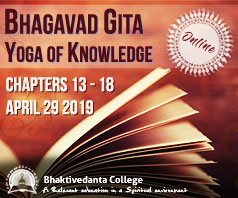 H. G. Aindra Prabhu received Harinama-diksha in 1973 from A. C. Bhaktivedanta Swami Prabhupada in Washington D. C. For many years he served as a puiari at the temple and regularly engaged in harinama-sankirtana and book distribution. After several visits to Vrindavan Dhama, he was inspired to revitalise the 24 hour kirtana which was originally started in 1975 at the Krishna Balaram Mandir. In 1986, Aindra Prabhu arrived at Vrindavan to live here permanently and since then he coordinated and led the 24 hour kirtana and his wonderful devotional kirtana records spread and far and wide the ethos of joy in the hearts of several devotees. Purity really is the force. I have spent hours at a time listening to his kirtans and bhajanas since 1991. Every time I went to Vraj I relished spending time listening to the 24 hour kirtan. Srila Prabhupada was right, there is actually no need to leave our compound when there is 24 hour kirtan. The last time I was in Vraj an incident took place that indicated the impact of Aindra Prabhu’s 24 hour kirtan. I was sitting in Srila Prabhupada’s samdhi chanting japa when a South Indian brahmana from the Sri Vaisnava Sampradaya came in. On enquiry I found out that he was from the Ahobilam Matha Asrama in Hyderabad. He said he had visited the temple several times. I asked him if he liked it. He said he did, and with tears welling up in his eyes he told me “I especially love the kirtan, it is so beautiful.” He said it all. It was by Aindra Prabhu’s courage in proclaiming the truth that Srila Prabhupada’s desired for there to be 24 hour kirtan in Vrndavana against all opposition that it became a reality. I trust that at this time Aindra Prabhu is relishing ecstatic kirtans with the Panca Tattva and Their associates. May he be kind enough to bless me to join him.